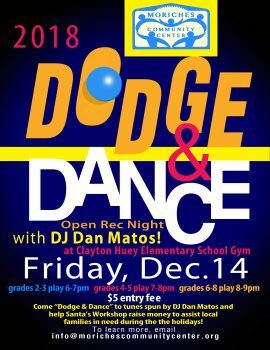 Thank you, DJ Dan Matos, for hosting and spinning tunes at Open Rec on Friday, Dec. 14, 2018 to raise funds for “Santa’s Workshop!” Students in grades 2 & 3 danced from 6-7pm (must be accompanied by an adult), students in grades 4 & 5 danced from 7-8pm, and students in grades 6-8 danced from 8-9pm. Only $5 to attend, and all proceeds helped our neighbors in need during the 2018 holiday season! For more info, email gro.r1556088738etnec1556088738ytinu1556088738mmocs1556088738ehcir1556088738om@of1556088738ni1556088738. 100% of the proceeds were used to purchase toys and items for local families in need! 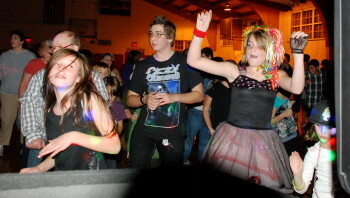 Check back soon for future Dodge & Dance dates!